Marmot Thor 2P, four-season tent. 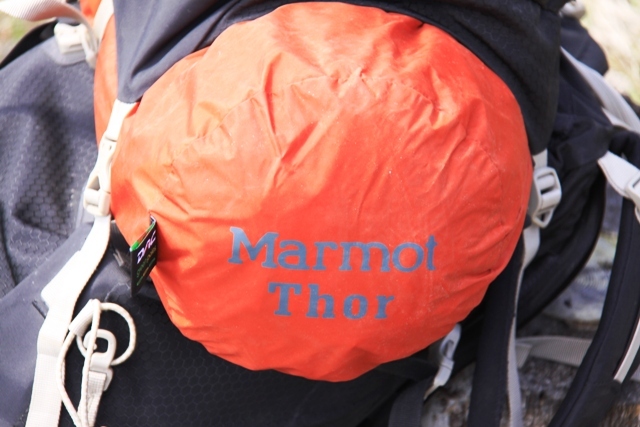 Thor is the name Marmot gave to this benchmark four-season, all-weather, mountaineering tent. It proved to be a great name choice. Norse mythology described Thor as the god of thunder, lightning, and storms. The legend of Thor could have easily included unmerciful winds and wind-driven high-elevation snow in the description. 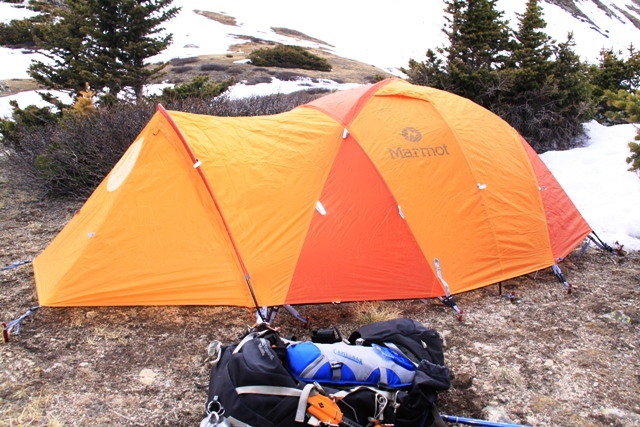 Well, the Marmot Thor two-person we evaluated lived up to every challenging weather condition we were able to get ourselves into during the late winter, early spring, and right up to rain and snow falls in early May. When your adventure territory includes mountain ranges like the Rockies, Cascades, Sierra Nevada, Mogollons, or any upthrust granite rock formation around the world, the weather can get wicked complicated in a hurry. High winds, thundershowers, and dropping temperatures can even bring snow flurries in June. 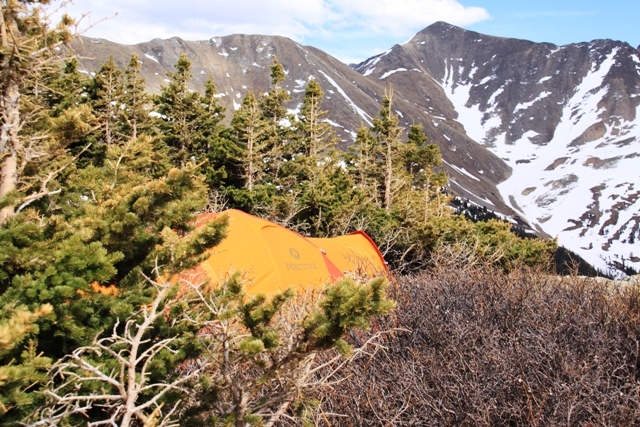 Our test grounds were exclusively in the Rocky Mountains of Northern Colorado. We’ve had this Thor pegged to the earth at timberline, about 12,000 feet elevation with knock-down wind gusts and impending storms gathering above the peaks towering above the Eisenhower Memorial Tunnel of Interstate 70 where it crosses the Continental Divide. Some fierce winds blew through this near 12,000 foot valley. Thor did great. Yah, baby, the winds could have blown this Terra Cotta/Pale pumpkin roll-caged bubble down to the chairlifts of Vail Ski Resort if it wasn’t nailed down. Good thing we had a grip on the ground in the rocky, still semi-frozen earth, with some sturdy DAC tent pegs and the DAC Dual Diameter Green pole frame structure. One of the characteristics we really like about the Marmot Thor is the strength of the tent frame. It’s just the way those dual-diameter DAC pre-bent aluminum poles are designed to create a frame that supports pretty much every square-inch of the tent body and storm fly. It’s almost like a NASCAR approved roll cage. No kidding. 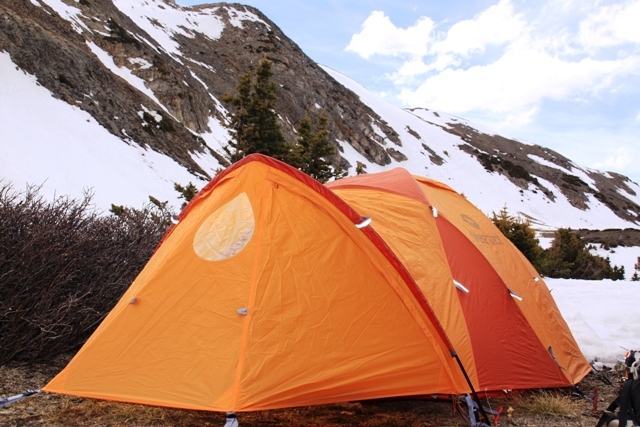 Marmot uses the traditional X-frame structure as a core tent support, and then uses the best qualities of a tube-tent design by including three cross-brace tent poles to anchor the top-center of the Thor and both lengthwise ends of the tent. 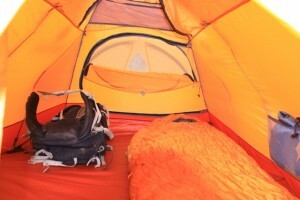 Add to that the pole-supported vestibule extension and you have a world class mountaineering tent. Thor setup step 3, with all five DAC tent poles in place. Note three support poles cross the primary X structure. There are five primary tent poles, and a sixth pole-frame giving the outer edge of the vestibule roof structure and support. On set-up, the first two poles create an X-frame that gives the tent body shape and primary support. Then three DAC tent poles cross the X to give the entire structure the kind of total strength that is said to be the strongest frame on the market. That would be a hard claim to dispute, as we experienced that strength in some scary winds. Under a snow load, this same strong frame allowed the Thor to retain its correct overall shape which remained taught. We did experience a light snow load on the Thor. And the elongated dome shape of the Thor was able to shed snow build up on its own due to the design shape and the steep sides. And, from the inside of the Thor, it just took a couple upward hand taps to trigger the snow build up to slide off the tent during the night. With just a few in-field tent set-ups, the sequence of assembling the Thor from a packed bundle into a ready to live in shelter becomes almost intuitive. 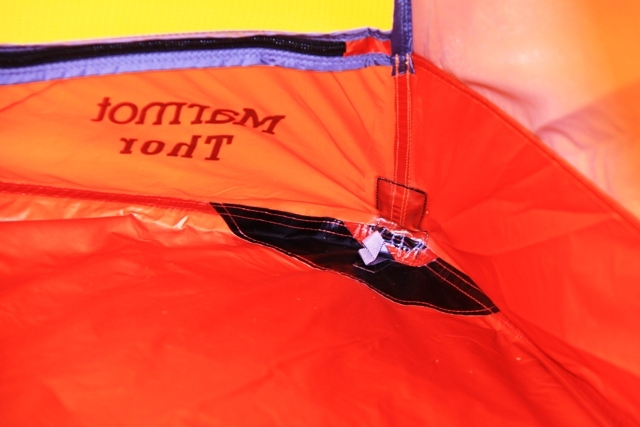 It helps that the tent set-up instruction are always available on a pull-out flap sewn into the main tent stuff sack. But with a little practice set-up and take-down can go fairly quick. The most recent outing with the Thor was on the eve of the Supermoon of 2012, the full-moon that appeared 30-percent larger than normal full-moon events. A significant spring storm was also moving into the Rocky Mountains, and you could see something big was building up. Folks that made their way up into the high country took off because the cloud cover and wind where shutting down the outdoor theater. No Supermoon show that night. Wind gusts got one’s attention late into the night. Marmot Thor can handle much heavier snow fall than you see here. Being inside the tent with the backpack gear gave some assurance there was sufficient weight to keep us on the ground. And the spot chosen to set the Thor was sheltered a little on both sides with dwarf pine trees. 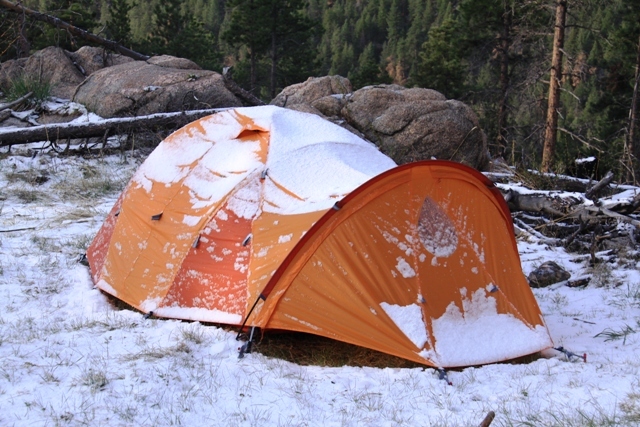 A four-foot-deep slab of snowpack was at the rear entry of the tent. So we thought we selected the best relatively flat spot we could to shield against the wind. Nonetheless, the wind howled like we were living in the jet stream. The Thor withstood some harsh winds, and we were as safe as we reasonably could hope for. Early the next morning, the weather was fixing to revisit winter with high-elevation snow fall. It took less than 30 minutes to break down the tent and pack it up. There was some incentive, where we had parked the truck at the trailhead and the entire region at that elevation was looking like we either better get gone or be prepared to ride it out. This was in an avalanche prone area, so we high-tailed it. No cell phone coverage up there. No excuses for missing Monday morning work schedules, and nobody is going to come look for you during a storm. Inside the Thor, we enjoyed ample room. The interior provides enough length and width to accommodate two adults in cold-weather down sleeping bags. Interior height of 43-inches is good for sitting up and moving around. If you are six-foot or taller, the Thor offers plenty of room for your body and gear stored inside. 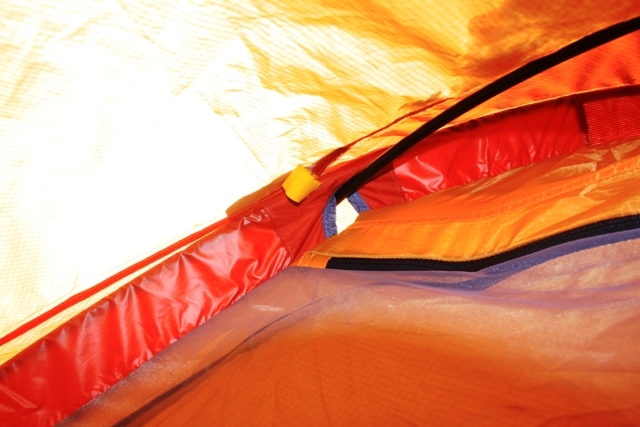 Interior of Marmot Thor two-person tent. Nice cabin. Mesh gear-pockets are positioned on both sides of the Thor so each person can stay organized when they empty their pockets at night. 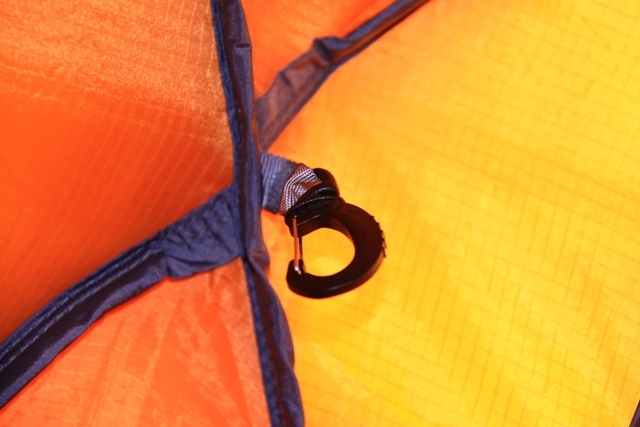 A gear hook is located at the crown of the tent to hang a light. You also have an internal guy line system to double-down on structural support when the winds get epic, and you get nervous about going for that e-ticket ride down the mountain. Although you’ll choose one of the two tent entries to have your vestibule entrance, it is a good option to have when two folks are sharing the tent. Each person can their own tent door. With the vestibule-end of the Thor, you can expect 10-square feet of useable storage space. When you are in wet, muddy, or snow covered ground, the vestibule is roomy enough to slip into the tent part way and take of your boots before getting settled into the townhouse. In the photo gallery below, you can see an image of the airspace between the main tent fabric (coated 40d 100-percent ripstop Nylon) and the rain fly (40d ripstop Nylon with 1800mm Silicon/Polyurethane coating). That air space works awesome with the two roof-top ventilation openings and the interior oval mesh-barrier windows and mesh tent doors. Ventilation is super with the Thor. 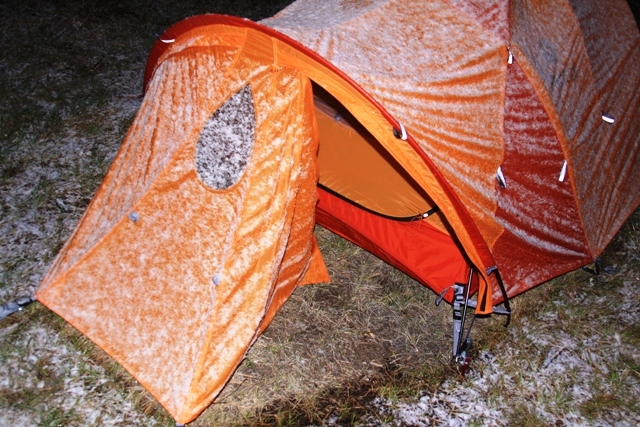 Even though each test trek with the Thor was in moisture-laden conditions, condensation build-up was not an issue. That’s huge. 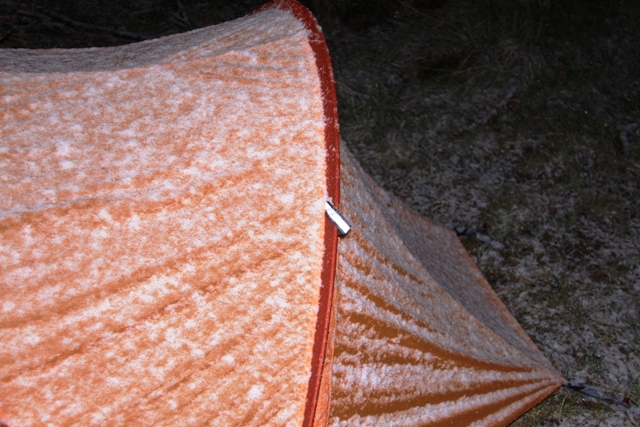 With personal insulation being down-filled, for the most part, our down sleeping bags and jackets stayed dry. Noiseless and snag-free zippers throughout the Thor tent worked flawlessly, even with cold, crooked, fragile, many times broken, hands. 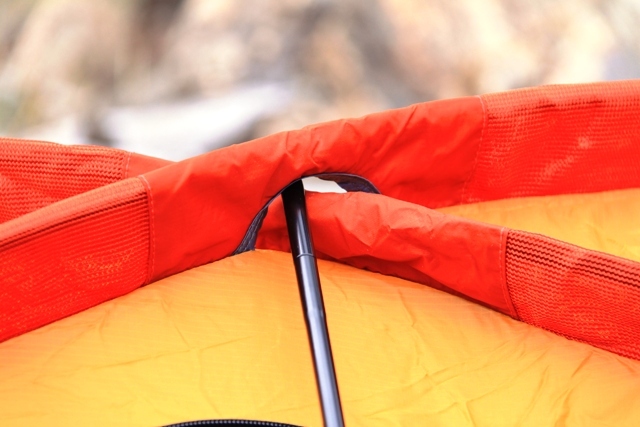 The zipper system is a value-add feature that was thought out very well when Marmot product planners and tent designers chose to run with this setup. Most every aspect about the ventilation, egression (tent entry) and exit room works well. Thor vestibule entrance offers 10 square feet of storage. 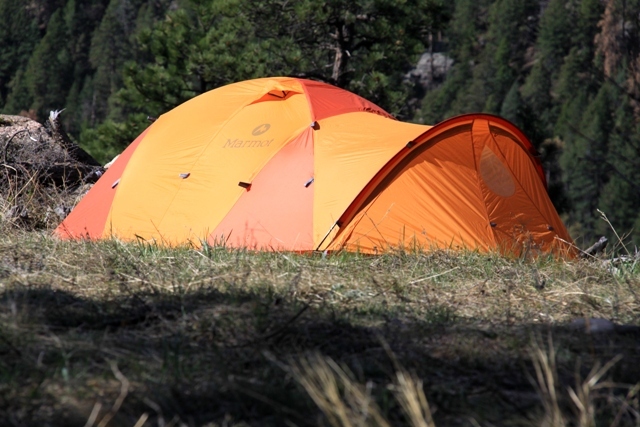 Yes, the Marmot Thor is a mountaineering tent by design. 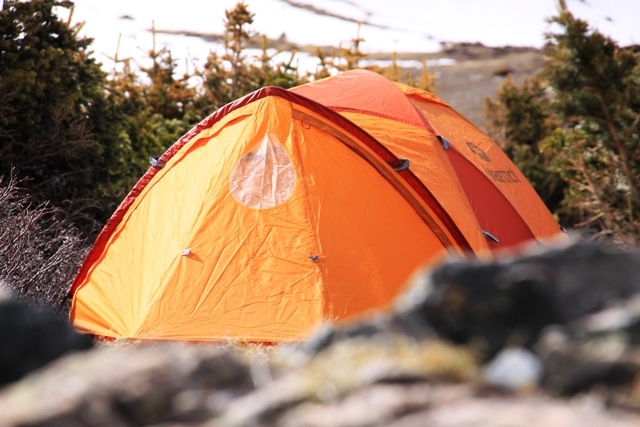 However, a tent built this sturdy can be used in any environment a backpacker is likely to choose as a destination, even if it’s an arid geography like the trails running to the bottom of the Grand Canyon. 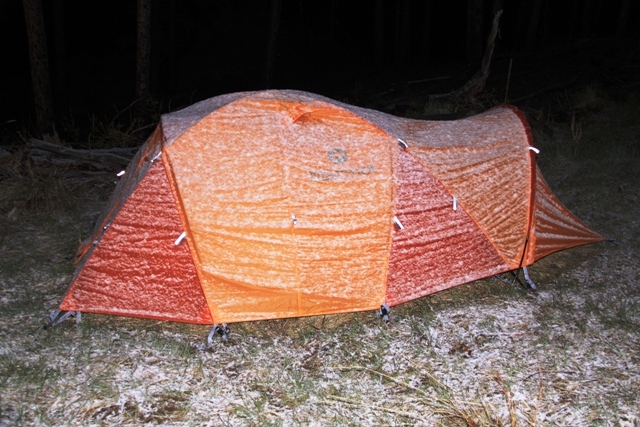 When your destination’s weather forecast looks like mild conditions, you can go super lightweight by using just the DAC poles, a footprint ground cloth, and the rain fly for an easy, strong, shelter. With a MSRP of $499.00 U.S. dollars, you get value that will pay for itself in a season, whichever season you choose. You can invest a few dollars more and get the optional footprint ground cloth sized specifically for the Thor. 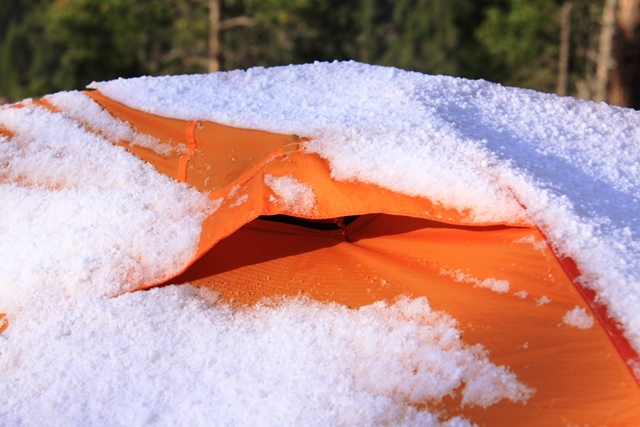 With the footprint, you have extra protection under the full strength Thor, or you have something to protect your blow-up sleeping pad when you go ultra-light with just the pole system and the rain fly. I immediately saw the range of options Thor offers, maybe you will too. 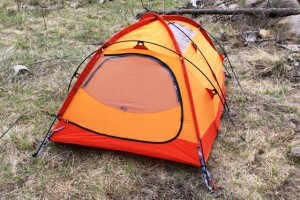 Marmot Thor two-person tent packs to 8×20 inches with all components in same stuff sack. But Thor can be broken down into separate parts to store inside the pack or distribute to tent partner. At a maximum packed weight of about eight pounds and a minimum weight of about seven pounds, the Thor is a significant weight consideration. 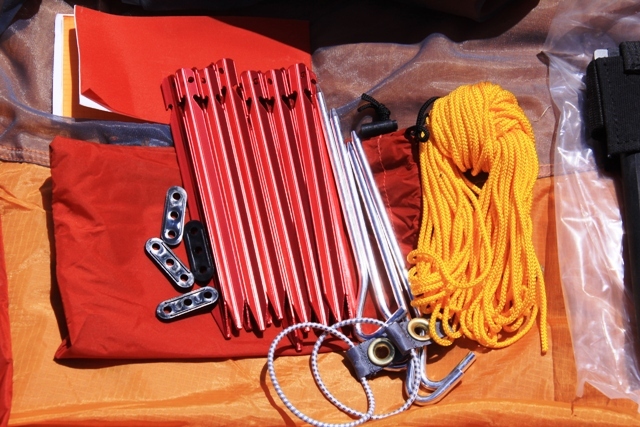 Yet because the components of the Thor tent are compartmentalized (Stake/guy line/repair kit; DAC pole kit; tent body, and rain fly), you can share the pack weight with your tent partner. If your trail dog has its own pack, you can delegate the stake kit and rain fly to its burden. In a large capacity backpack like the 65/85-liter pack I go to, the entire Thor can be broken down in component parts and distributed inside the backpack with nothing showing outside the pack. Also, I am able to fold and roll the tent body, and the rain fly, each into much smaller bundles than the 8×20-inch primary stuff sack requires. The weight of the Thor is negligible (not important) to this writer. If Thor was a pound or two lighter, what would that weight savings do to the structural strength? The DAC pole system is second to none regarding tent strength, reliability, and longevity. The tent is a bomb shelter as far as mountain weather goes, so the weight is simply a fact to be packed, just like the water supply. Neither is light, but both are worth the weight. What didn’t I like about the Marmot Thor two-person tent? That’s a question to ask if it ever failed. In the upper elevations above 7,000 feet, a solid four-season tent is the best practice in gear to have. 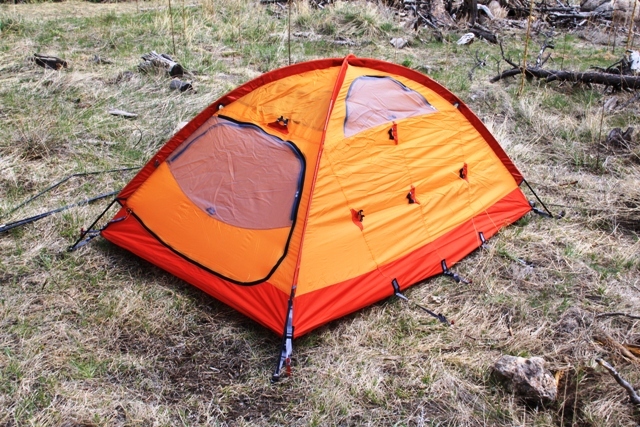 In my view, this Marmot Thor two-person weather shelter lived up to the claims resonating from so many back country trekkers and mountaineers who count on the strength, durability, and ease of setup/take-down the Thor has delivered for them over the years this tent has been available. 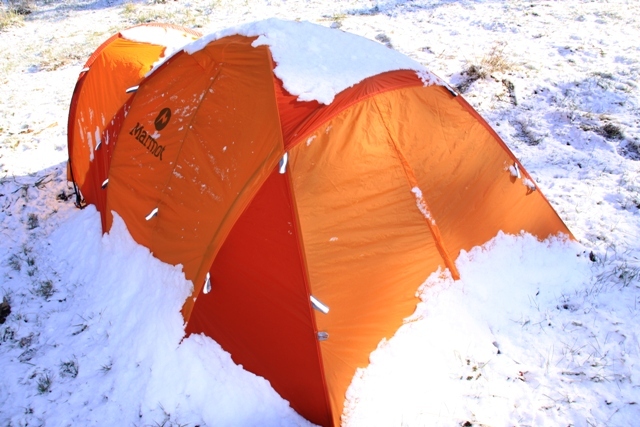 And it’s little wonder why the Marmot Thor two-person and three-person tents have remained in the Marmot equipment lineup since it was launched years ago, because it is a sound structure that stands up to unyielding weather conditions. Marmot Thor amongst dwarf pine at 12,000 feet. Thor vestbule entry works well for tall folks. Thor 2P tent after spring snowfall. Marmot Thor 2P second entry way. Thor uses two roof vents, one on each side of the crown. Thor features a poled-vestibule for strength, shape, and taughtness of entire structure. Note light-reflecting points to find Thor at night. 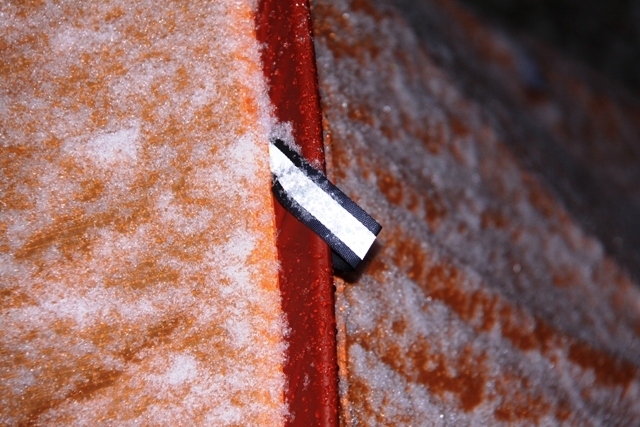 Close up of light reflector tab for locating Thor at night. Thor flooring is 5000mm thick pure Nylon. It’s weatherproof, durable, and extends up tent wall. Airspace between tent body and rain fly helps manage condensation. Note how the fifth pole crosses through tent structure. It’s strong. The No. 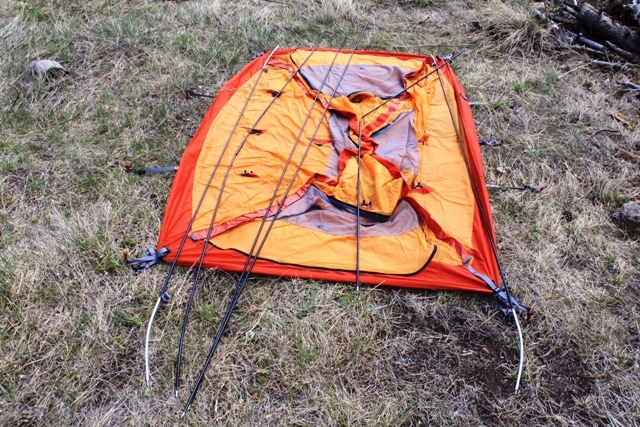 3 DAC tent pole crosses the apex of Thor to tie the roof together with the primary No. 1 and No. 2 poles. Strong. Some fierce wind blew through this near 12,000 foot valley. Thor did great. Interior roof gear hook let’s you hang what you have to. 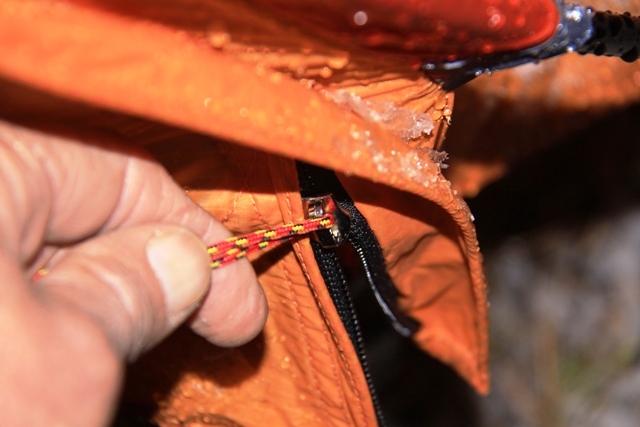 Snagless, noiseless zippers are rugged, and worked flawlessly. DAC tent pegs, guyline rig, and Thor repair kit are included. We didn’t use the guyline rig in testing, but we should have on one trip. Marmot Thor laid out for setup. Note six DAC tent poles. Setup step 2, Thor with No. 1 and No. 2 DAC poles forming the primary X structure support. Marmot Thor setup step 4, affix rain fly over tent, fasten C-clips, and snug-up all connection points. Secure guy lines in heavy wind conditions if needed. Done. So I just picked this tent up and am really interested in how to set up just the footprint and rainfly properly (for an ultralight setup). How are the poles managed with the rainfly? Are they threaded over (through the reflective loops) or just underneath, in the velcro tabs? Are you aware of any videos or quick articles on successful footprint/rainfly setup and use? I’m also looking forward to use this tent (complete) as my winter bomb proof mountain shelter.